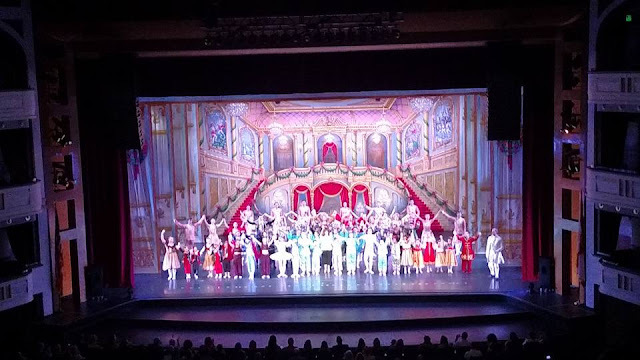 This year I was given the opportunity to review the Moscow Ballet's Russian Nutcracker at Mahaffey Theater. 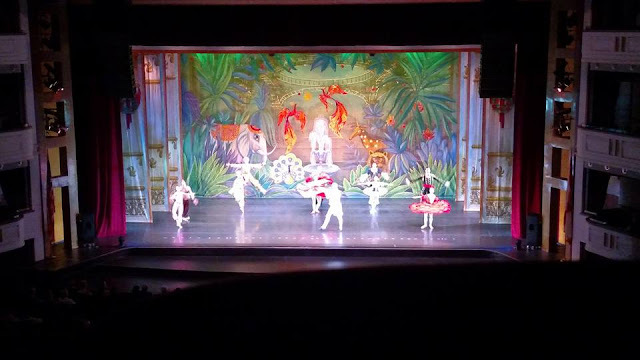 I have never been to an actual ballet and have not see the Nutcracker live so this was going to be a new experience with me. I took Tierney with me because when she was a little younger she would sit and watch ballets on tv all the time. For the longest time she wanted to be a Rockette. I thought this would be a great way for both of us to experience the ballet. 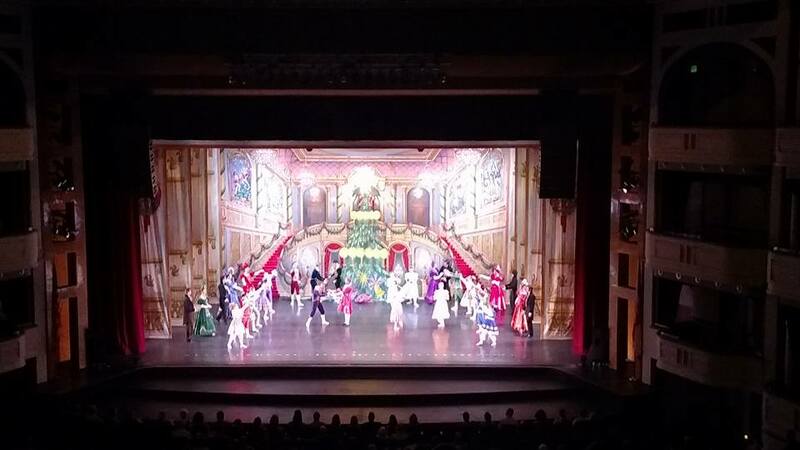 The Moscow Ballet's Russian Nutcracker is preforming at the Mahaffey Theater in Downtown St Petersburg, The actual venue is very open and accommodating, both inside and out. 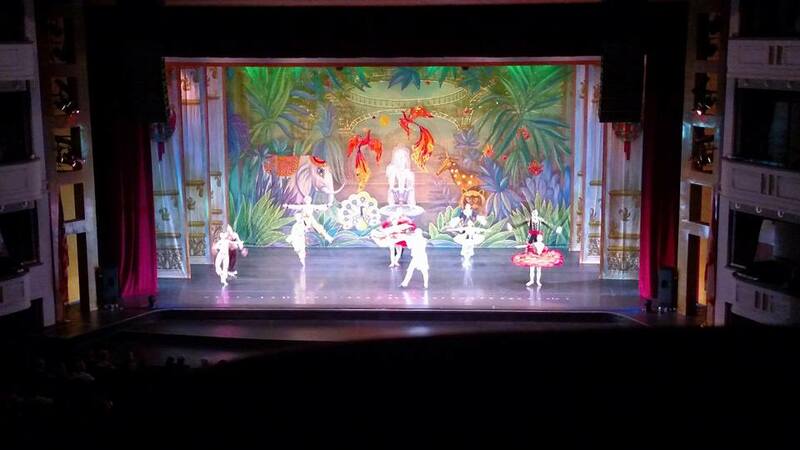 We got to the theater just as the ballet was starting so it was a bit dark and everyone else had already been seated. The usher was very nice and quickly directed us to our seats. 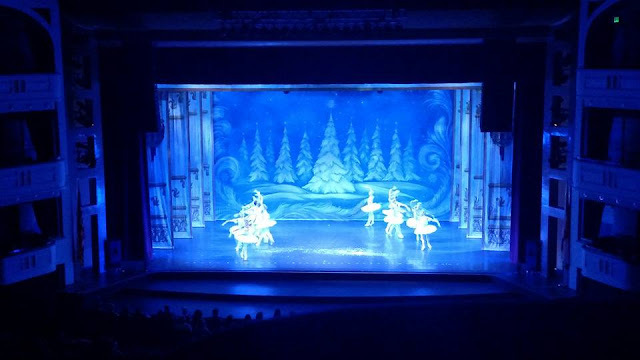 The ballet starts with a Miniature Overture while Uncle Drosselmeyer gets his life sized gifts ready for his niece and nephew. The family is getting ready for the Christmas Eve Party when Uncle arrives with all his magical gifts. As the story continues, Uncle Drosselmeyer oversees a puppet show that go through the events of the Nutcracker and a large bag of gifts shows up. All the recipients are happy except one, Masha, She did not get her present yet and is feeling left-out. Uncle Drosselmeyer then presents her with a Harlequin and Moorish Dolls. 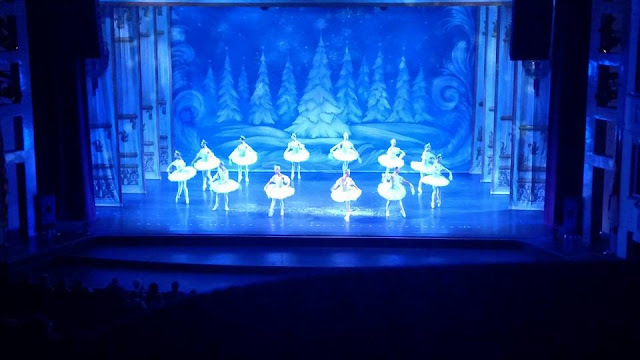 The night continues and Masha's brother, Fritz is jealous and he breaks the Nutcracker. After the party ends, the guests leave and Masha falls asleep. Once everyone is sleeping her uncle repairs the Doll. As the clock strikes midnight, Masha wakes up to the mice in her room. She wakes up and tries to run away but can't. 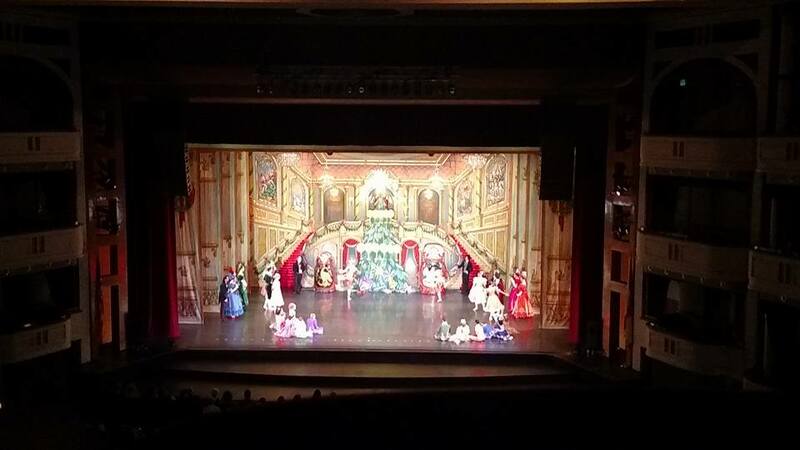 The Christmas tree starts to grow and grow, filling the room and the Nutcracker comes to life. He can now help save Masha from the Mouse King. As the fight between the Nutcracker and Mouse King goes on the music follows along seemingly. 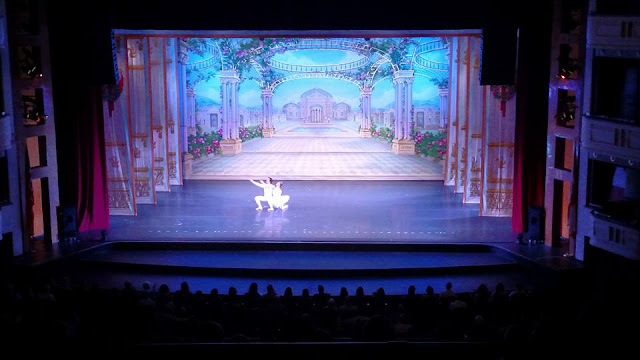 The Nutcracker defeats the Mouse King and is transformed into the Nutcracker Prince. He and Masha then travel to the Show Forrest where they find all the traditional Russian folk figures. They are in the Land of Peace and Harmony. 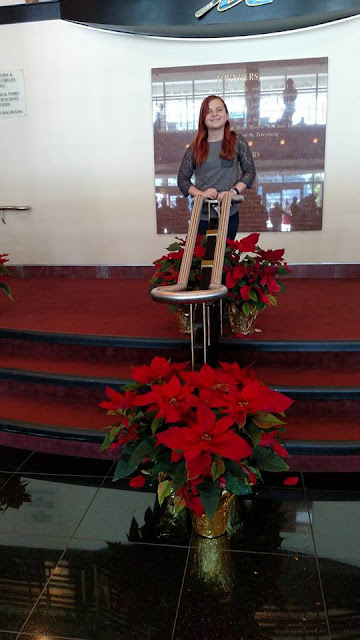 Intermission: During the intermission we decided to walk around the Mahaffey. I had only seen the outside of the theater previously so this gave us a chance to see what else the location had to offer. There were a few different areas to get something to eat and drink. There is a large open area for a sit down meal. 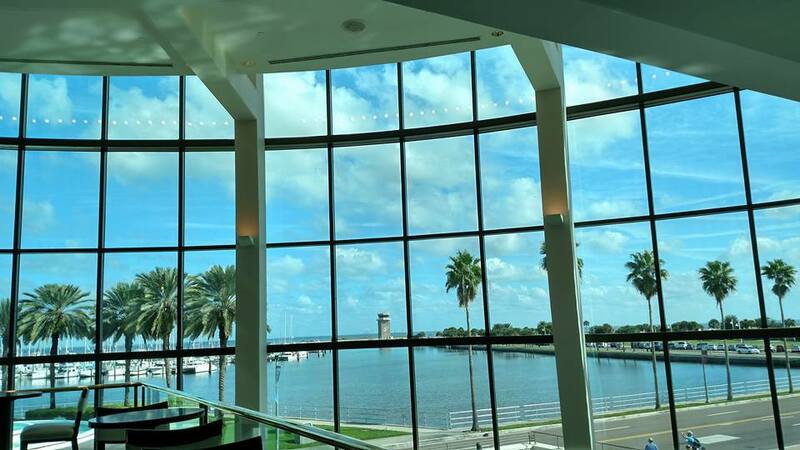 And of course the large windows overlooking all of the Downtown St Pete water. The ballet continues after Masha and Nutcracker Price arrive in the Land of the Sugar Plum Fairy. The Dove of Peace is the act following the opening. This performance was amazing! The 2 dancers balance off each other and use each other to transform themselves, as a pair, into a beautiful white bird with a 20 foot wingspan. 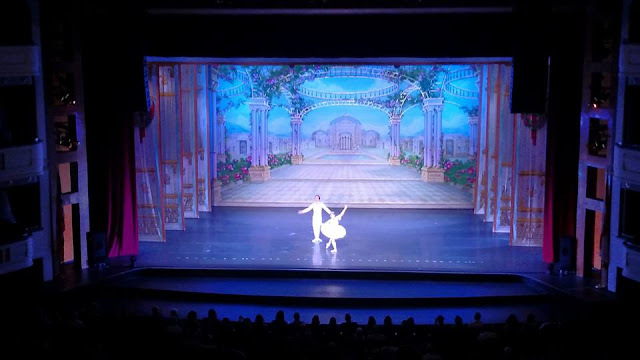 The Dove of Peace lead Masha and Nutcracker Prince into the Land of Peace and Harmony. 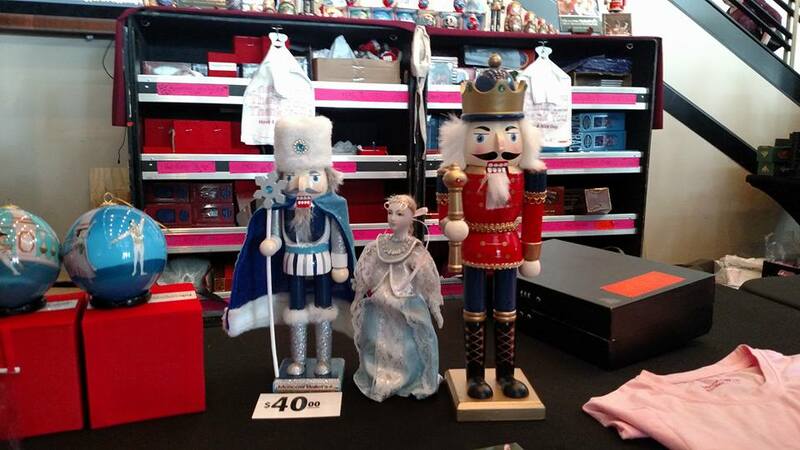 In the Land of Peace and Harmony dolls appear from around the world to welcome Masha and Nutcracker Prince. 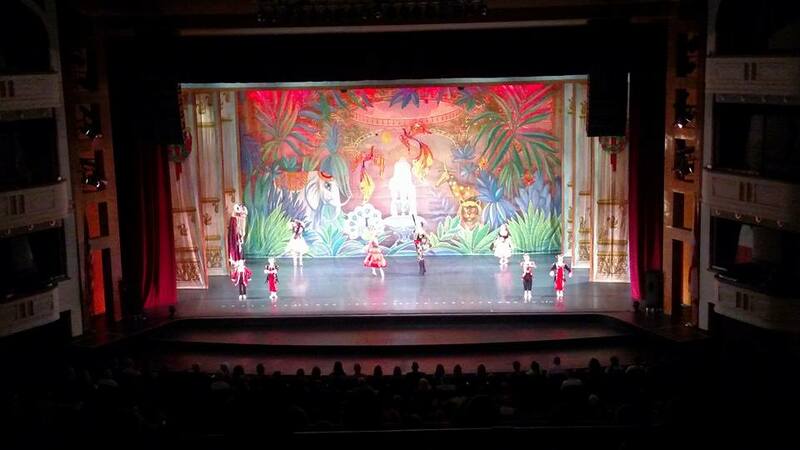 They dancers are representing the Chinese, Arabian, Spanish, Russian, and French country heritages. The dancers are each accompanied by 10 foot tall puppets that are symbolic to the county. Puppets include the Chinese Dragon which brings the gift of playfulness and the Arabian Elephants with gifts of wisdom. 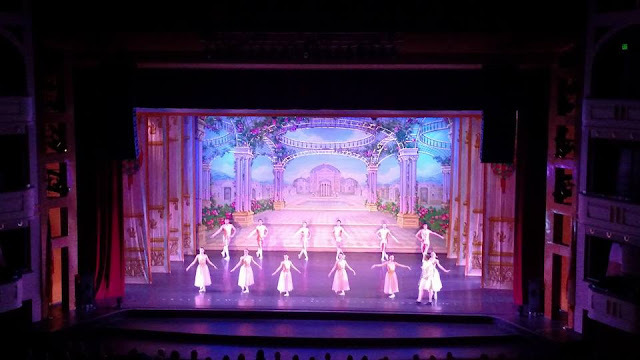 As the final scene comes into play, you are taken through a Waltz of Flowers featuring the 8 men and women dancers from the countries. 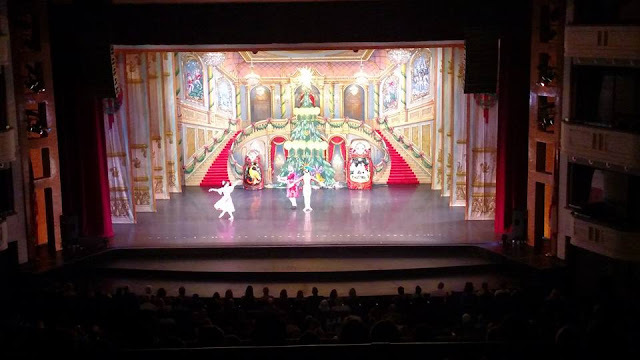 Masha and Nutcracker Prince show they gratitude through a dance of their own, the Grand Pas de Deux. As the night ends, Masha is back in her room, with her Nutcracker Doll by her. Overall: The show was very well done. I was not sure what to expect but the whole performance and experience was past my expectations. 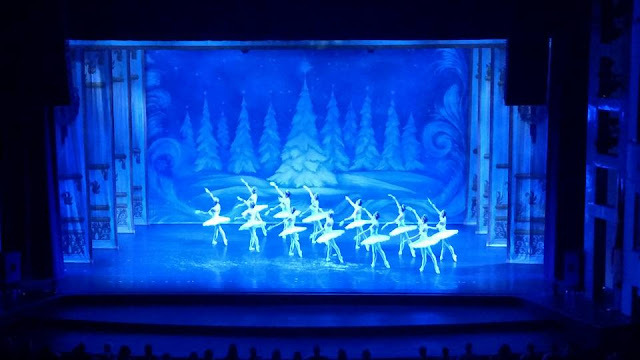 The dancers were all in sync and very ___ with the audience. The costumes were exquisite and the backgrounds were very all beautiful. The backdrops were created by an award winning Russian designer, Valentin Federov. The music throughout was perfect, you could easily follow along with the rise and conflict. As for the venue, it was a great choice. The theater was clean and well kept. Big and open with plenty of seating. The actual seating options for the ballet all seemed to be really good. It looked like no matter where your seats were, you could clearly see the stage. The only downfall I think would be the parking. Not at the fault of the Mahaffey but more so because there were other events going on in the downtown area so the parking spaces outside of the parking garage were all taken, leaving everyone trying to get into the garage. Once we actually paid for parking we were able to find a spot pretty quick. 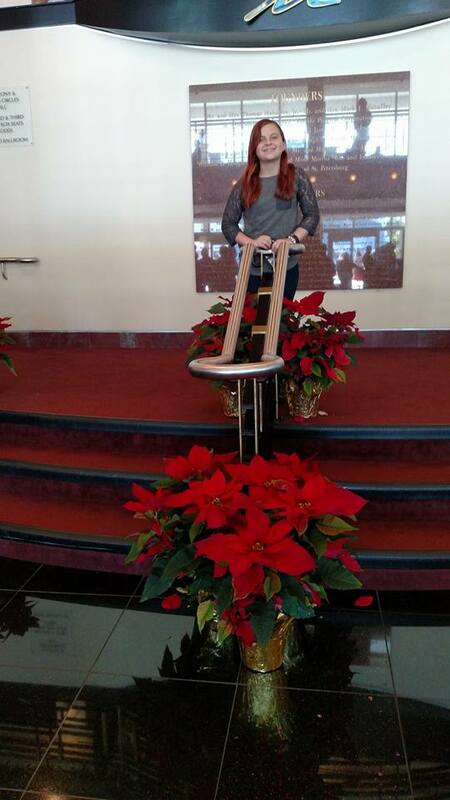 This is a great way to continue the spirit of Christmas after the holidays are over. It is also a great tradition to go back year after year. I will definitely be going back again next year. Have you ever seen the Moscow Ballet's Russian Nutcracker? 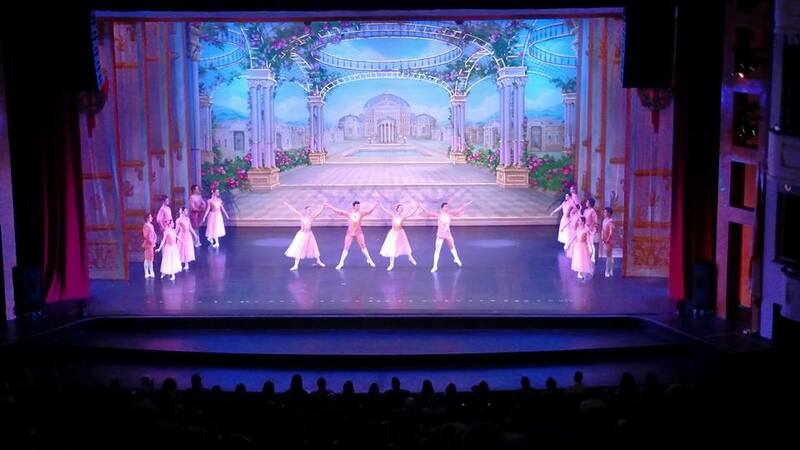 There will be 3 opportunities to see the Moscow Ballet's Russian Nutcracker this year, on December 26th. To get your tickets please head over here. You can also find a performance of the Nutcracker, and other productions, from the Moscow Ballet in your area here. 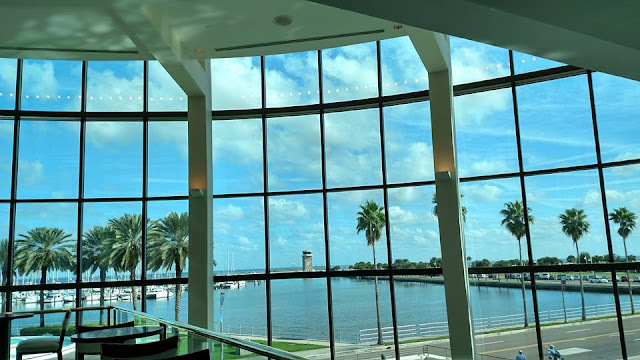 For more information on events at the Mahaffey Theater please visit them here.